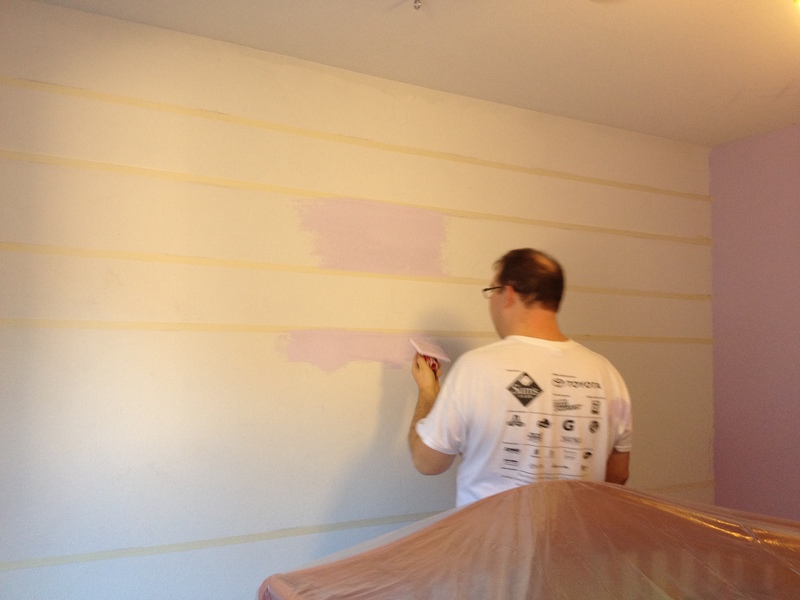 Fast forward a few months to November 2013 and we finally were able to paint the walls. 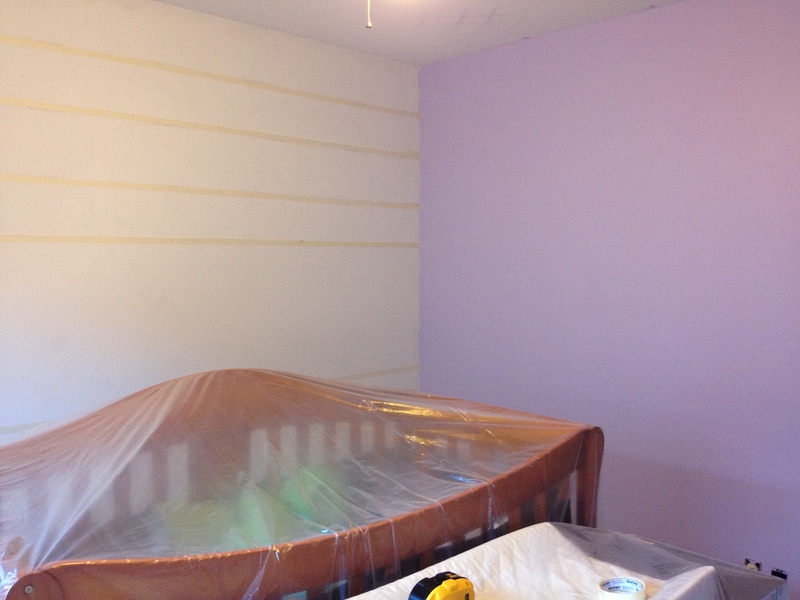 But before we could prime the walls, we had to scrape the awful worse-than-popcorn-ceiling texture off the walls. It was bad; you could cut your hands on the wall’s texture it was so bad! Thanks to Marshall’s dad we were able to use this cool gadget that made it a lot easier but it was still WORK! 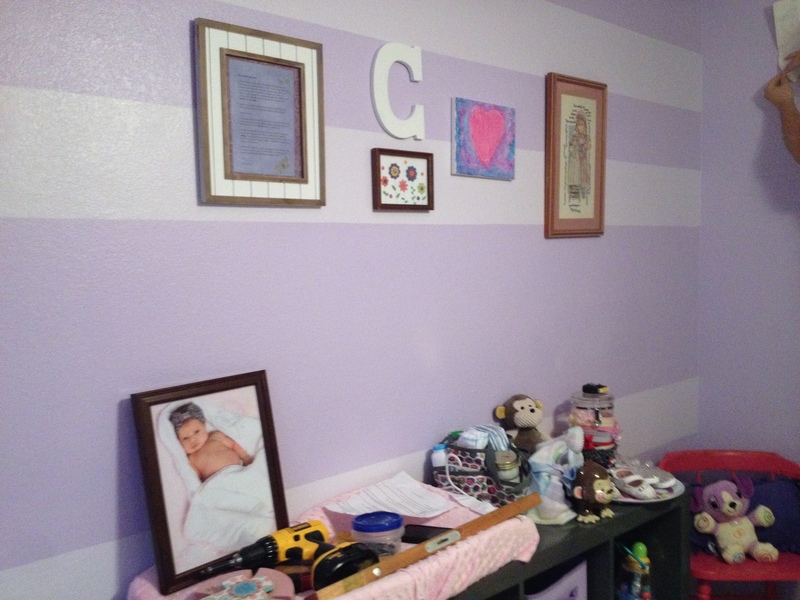 We used two different shades of purple and thanks to my amazingly talented husband, we created an accent wall with stripes. We used masking tape to make the lines! Testing out the paint colors! On the striped wall, we have lots of special decorative pieces. The white frame is Charlee’s life verse/letter. The C was on clearance at Michael’s. The little framed flower piece I found for a dollar at the Salvation Army. The beautiful heart art piece was painted by a very talented young artist who was raising money for an ethiopian orphanage. The final frame is a cross stitched piece of a little girl my mom made when I was a little girl. She gave it to me when I graduated from college and one day I will make sure Charlee is able to place it in her home. Perhaps when she has a little girl of her own! All paint complete and some of the decor in progress. 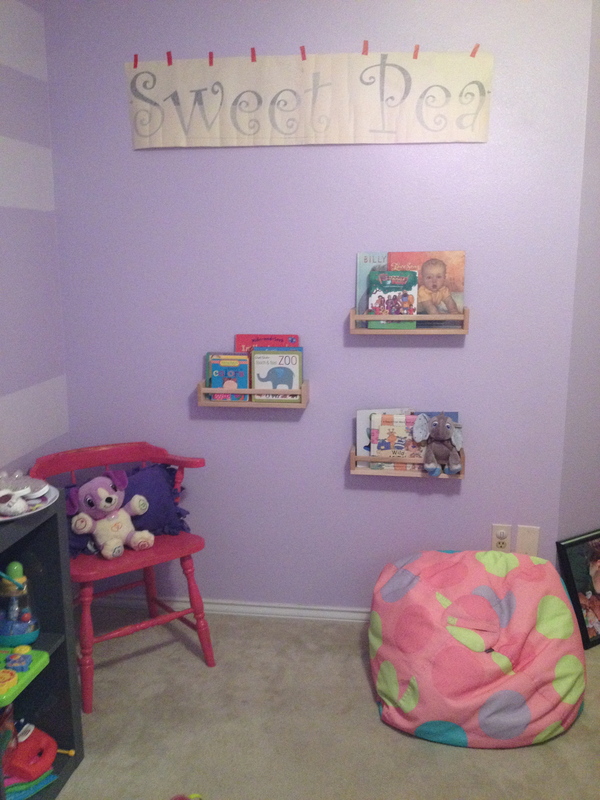 At the same time, we placed the art work on the striped wall, we made a book wall. 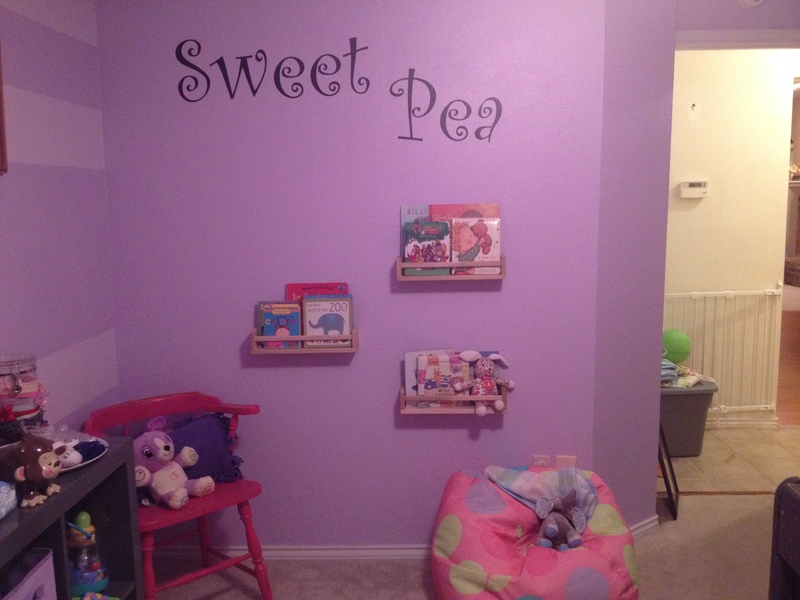 This wall cost us a whopping $9 since we were given the wall art “Sweet Pea” from a friend for free! 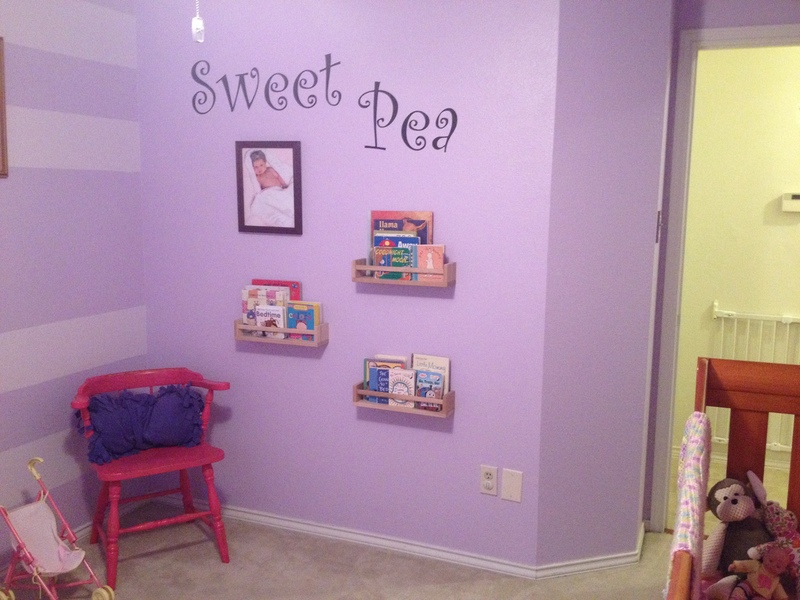 A book wall using $3 spice racks from IKEA. Thank you Pinterest! 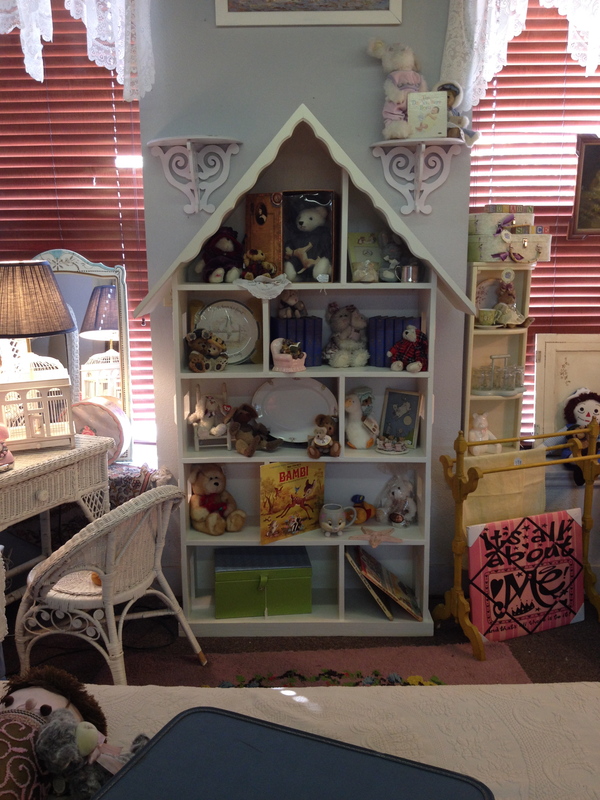 I found this beautiful dollhouse bookshelf on a Facebook Yard Sale site for $35 and it came with an IKEA table and chair set included in the price! 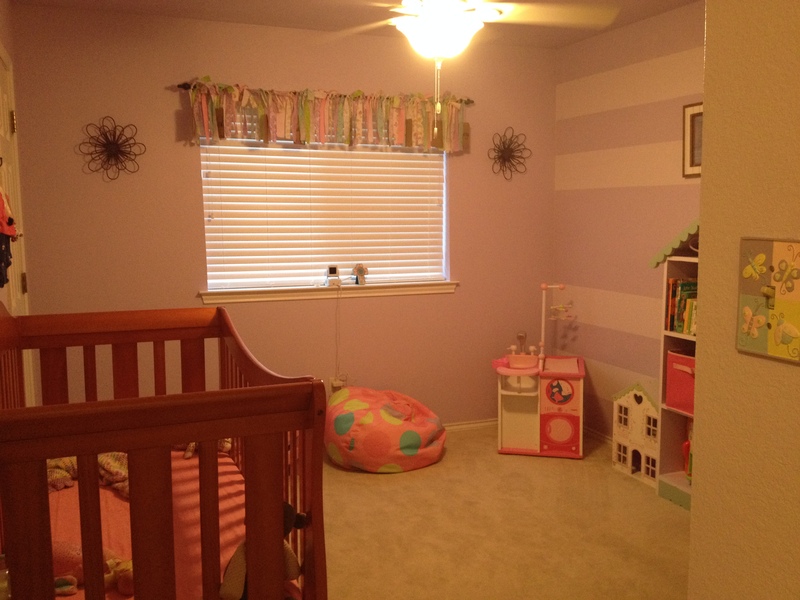 What was really awesome about this project was that we had all the paint. All colors are leftover from other projects! I have come to the conclusion that if I can dream it up, my husband can do it. 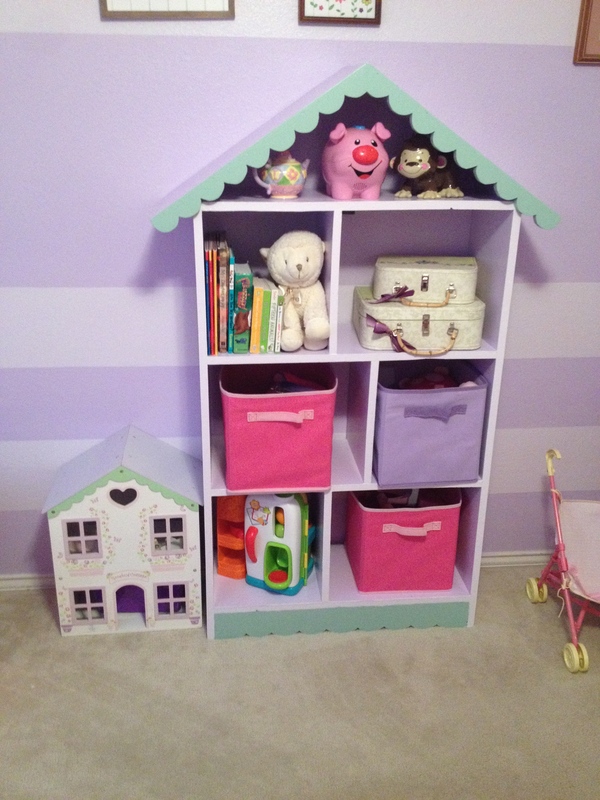 I envisioned matching this bookshelf to a little dollhouse I found for Charlotte on the cheap on…you guessed it a yardsale site. Don’t they look cute together!! 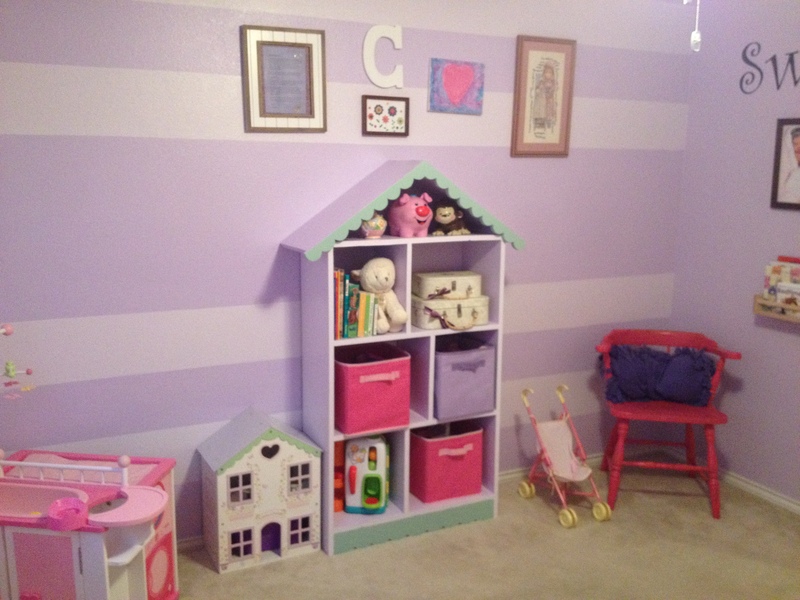 I still have a few more ideas for the striped wall. I have some material that I’d like to make bunting that I hang to the left of her lifeverse frame. I also have a postcard that says, “She knew she was born for such a time as this” that I would like to place on this wall. But I am really please with it’s current look. 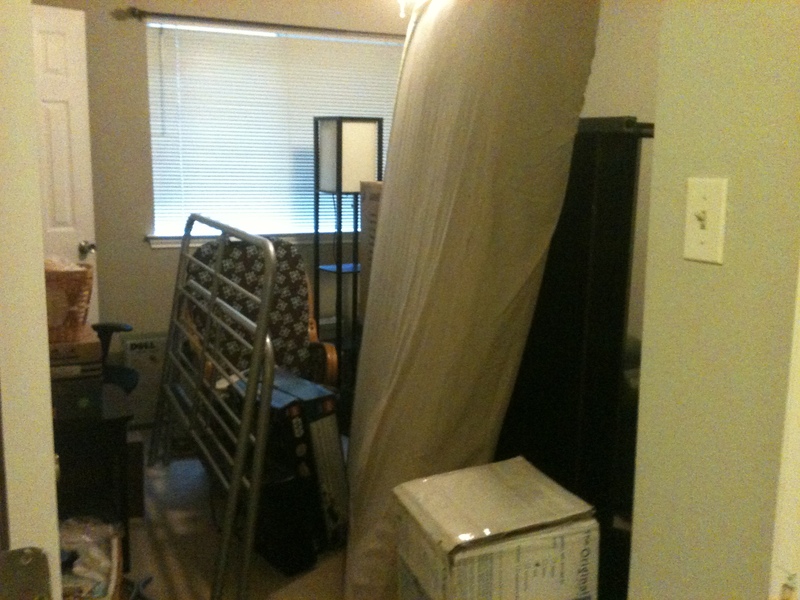 What it looks like today. So pleased! So proud of her space! 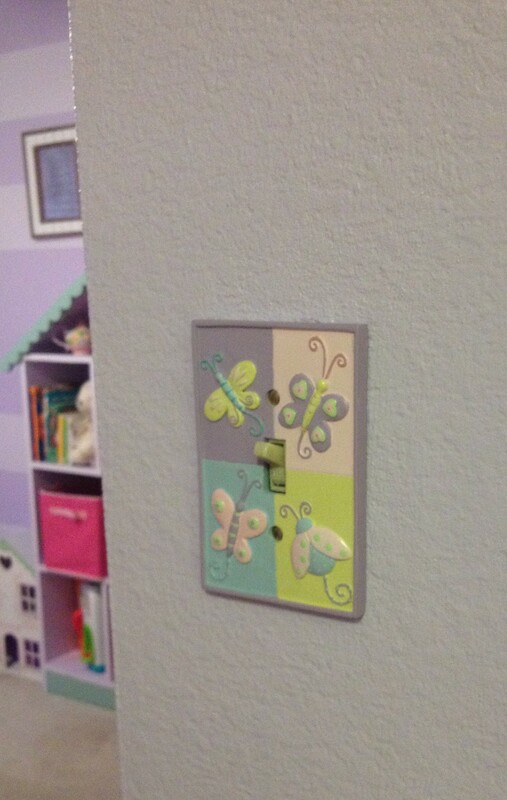 Light switch my mom gave me many moons ago! I am pretty proud of this valance. I saw something similar on Pinterest. 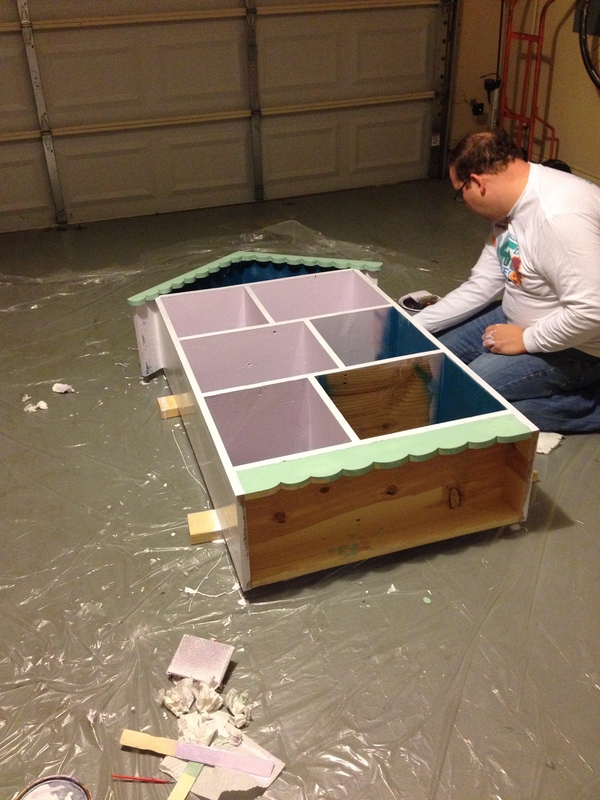 (So many nights on the couch watching tv and working on this!) 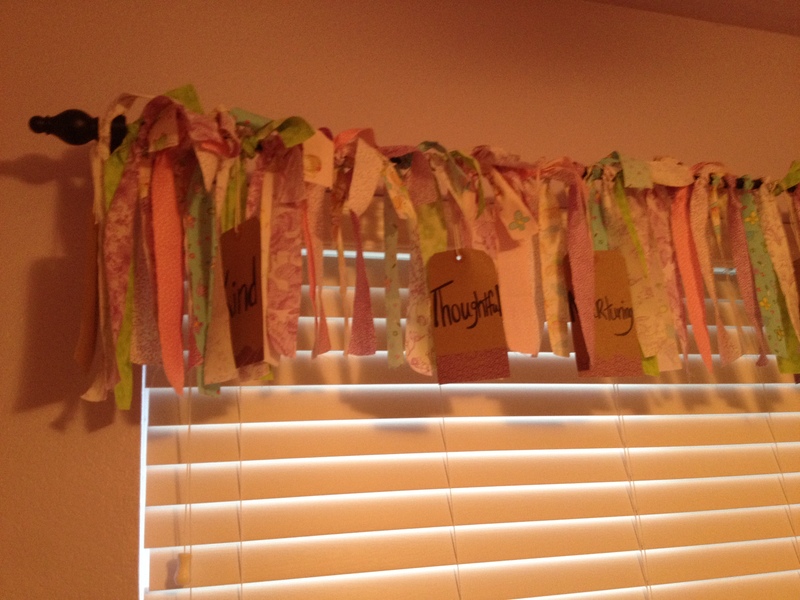 In addition to the fabric scraps, I hung these beautiful tags that my amazingly thoughtful friend Stacy used for decoration at Charlee’s baby shower. Each tag has a character trait she sees in me and prays that Charlotte will possess. Homemade valance. Thank you Pinterest! Her sweet little coming home from the hospital outfit! 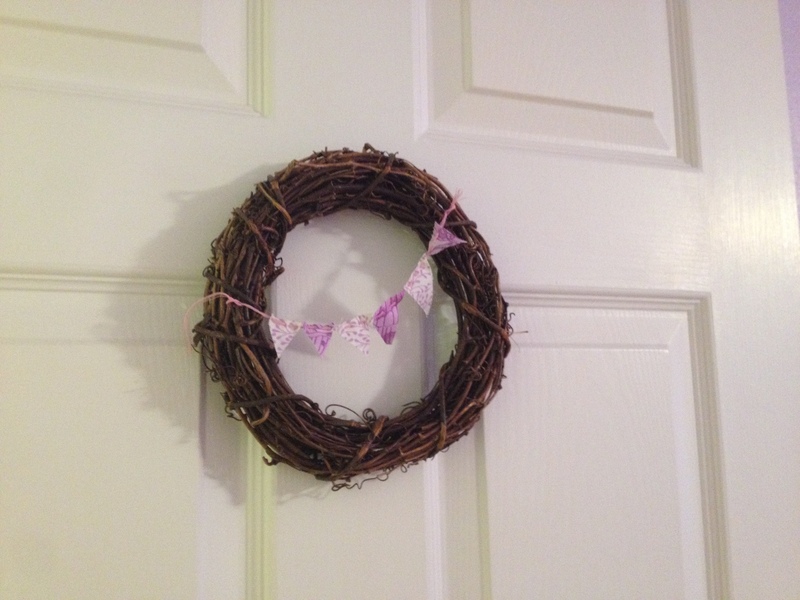 What I learned from this project that I hope will help you out as you brave your own decorating journey! 1. 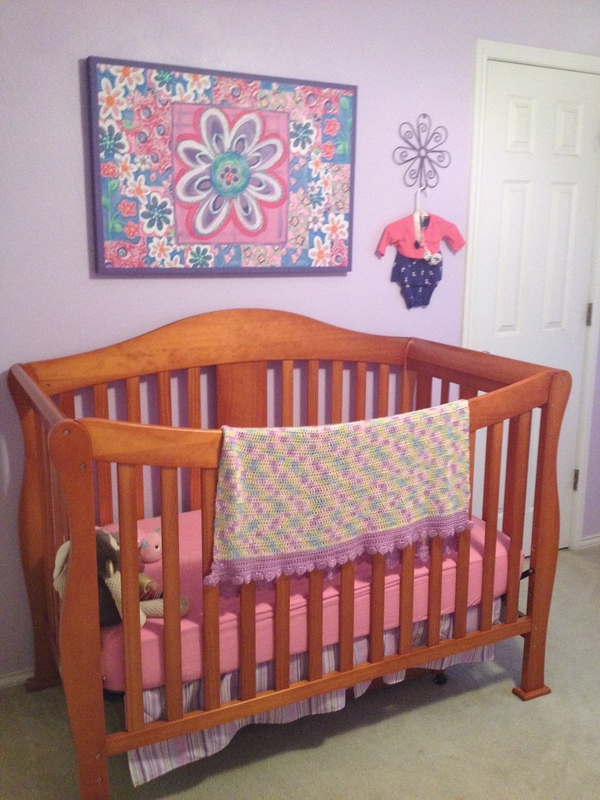 Sentimental is king– Some of my favorite decorative pieces in Charlee’s room are very sentimental. 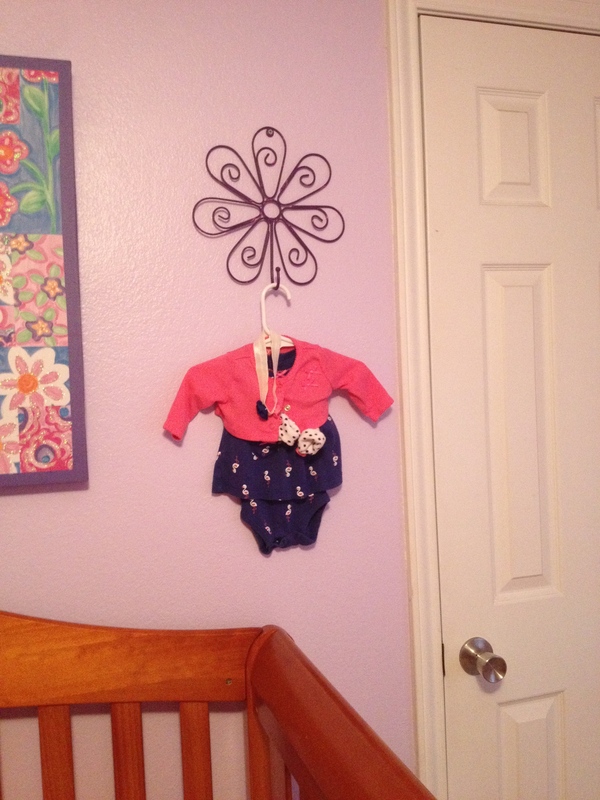 Charlee’s take home outfit, the cards from Charlee’s baby shower, the cross stitch piece, Charlee’s life verse all truly make the space and have a special story or meaning behind them. These items with stories are what makes it your space and that’s really important! Be sure to include these in your decorating plan! 2. 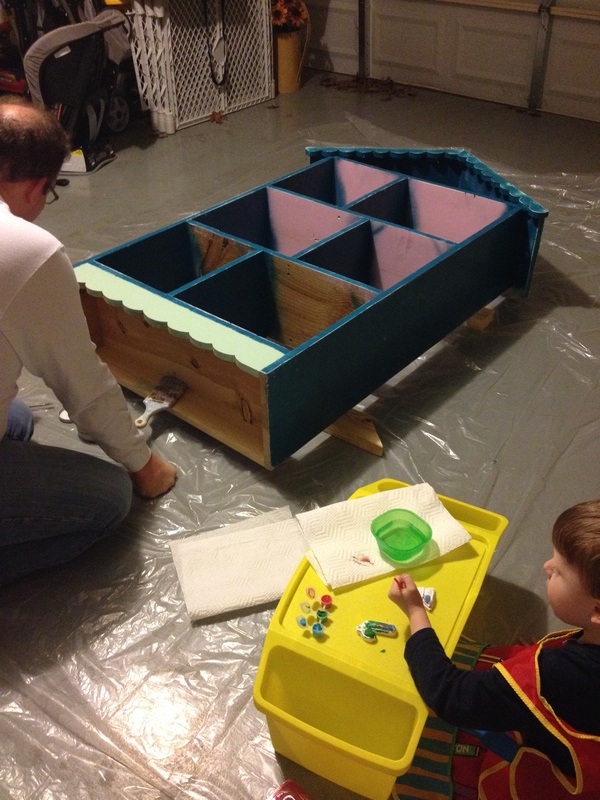 Use what you have– I’m still pretty proud of how we resourced the paint we had on hand to paint the dollhouse bookshelf. You never know what you have on hand that may be even more perfect than heading to the store.